I am very pleased to introduce this in-depth look at both what is leading brands to engage in inauthentic and non-sustainable activities by Gunther Sonnefeld. It is well worth a read as it offers a deep dive into both a look at what is causing these issues, and also how brands can restructure, in order to re-engage with their customers and communities. The re-visioning of brands is a theme that Gunther and I have been discussing together, and which has already lead to an extremely interesting discussion in the comments section of my article Holonomic Brand Values. I wanted to publish this new article from Gunther as I have been having many more thoughts about what it means to be a truly sustainable brand, and a future article of mine will lead on from this one. Gunther and I are also planning another Google Hangout where we will be discussing sustainable brands and many related themes, so stay tuned for the details in the coming week or so. Whether all of these accounts are in fact true or not is obviously subject to debate. Nevertheless, it is horrific to think about on a human scale. More importantly, brands shouldn’t be burying bodies, but building their reputations authentically, warts and all. Of course, consumer cohorts are also fighting back. Emblematic of this shift is the now famous ‘Honest Coca-Cola Obesity Commercial’ which has garnered 4.35mm views since January of last year. Coke is certainly not alone amongst multinational corporations that have committed numerous violations to the sanctity of people, laborers and suppliers. But that is also not the point. Coke, specifically, has been rated one of the top brands in the world for decades, and as we head further into the ‘new millenia’, the separation between ‘brand values’ and corporate ethos is becoming more and more vast. In fact, it’s dysfunctional at best. Let’s be brutally honest here: there is no ‘open happiness’ in contributing to water shortage, land depletion, labor abuses, malnutrition, disease and, yes, blatant corporate espionage (have you read the Wikileaks documents?). If that’s what a top brand in the world is really like, we should all be ashamed of ourselves. In fact, we are complicit in this blatant disregard for people and their ecologies, because many of us buy Coke products. I know I have. To be clear, this is not an indictment of many good people who work for the brand and with the brand (in fact, I have a great deal of respect for what folks like Tom LaForge, Jonathan Mildhenhall and others are doing to push various innovations forward). Rather, it is a wake-up call for all of us. I’m also not suggesting that marketing, advertising and branding are the core of the problem. I’ve long had a passion for those disciplines and have pushed myself and others to help in their reform. The fact remains that these disciplines effectively help mask the realities of what these companies do and how they operate, and that is completely unacceptable, and has been for a very long time. 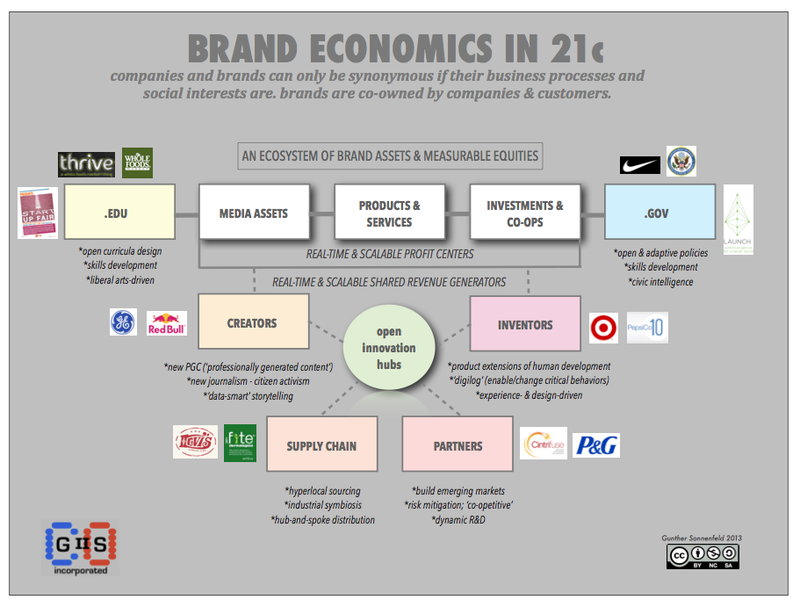 What actually defines a ‘brand’ in 21c? There are many ideas and term definitions as to what brands are, or could be. Brands are evolving as customers, consumers and cohorts become activists in a landscape that is far less tolerant of social, cultural and civic injustices. Further, at the root of systemic growth (or inertia) is an operational approach that must completely transform itself. We are no longer operating at a level of corporate or market scale whereby human and natural resources are in unlimited supply. Beyond that is a wide open territory tied to emerging markets and creative solutions to human problems which begs reinvention on the ‘traditional’ end of the marking, technology and media spectrum. No, I’m not talking about ‘digital versus analog’ or ‘non-traditional versus traditional’ – I’m talking about how brands are co-created and managed on consensual, equitable terms. These terms are based on infrastructural challenges, and where infrastructure lags, marketing, innovation and production can revitalize themselves, together, in an unprecedented synergy. Looking at it from another angle, if a brand is a system of beliefs about what a company says it is and what it does, then it would seem that these relevant disciplines are truly interdependent. Further, in marketing circles folks constantly wax on about brand-consumer relationships, but I fail to see how these are real relationships, if the disconnect still exists between perception and action. First, it is important to understand what this ‘shift’ in consumer cohort behavior actually looks like, and why it challenges the conventions of traditional capitalism, as well as the tenets of branding, marketing, advertising and myriad areas of research and innovation. This graphic might help; it shows some of the ways major companies are using technology, data and networks to provide products and services that are civic extensions of their brands. Yes, it’s still early days, but these ‘experiments’ are starting to show real promise. Leading brands like Nike, for example, are capitalizing on social movements to better understand market behaviors and sources for new inventions, and have been accelerating business ideas that are extensible with utilities they’ve successfully built (unfortunately, its Fuelband operation hasn’t remained operable for myriad other reasons, including a lack of go-forward vision and business application… but still…). Nike still makes beautiful ads, but its real stocktaking has come in the way it builds products and services with its customers. Others, like Target, are using social platforms to crowdsource design. Others, like P&G, have created joint-venture funds to build up local economies through entrepreneurship. Even more interesting are the efforts of smaller brands like Dermalogica, that benefit from outsourcing infrastructure and by building up value in the supply chain itself. And where government or educational institutions are slow to task, new co-ops and special interest programs expedite development and allow more people and more entities to experiment forward. The Happathon Project is one such platform that is pushing the boundaries of how citizens can mobilize data as a form of currency, a means to be happy and fulfilled. From a macroeconomic perspective, it is also important to realize that company verticals are undergoing a ‘horizontalization’ of sorts; this means that verticals tend to no longer grow at ‘scale’, but rather at the paces of networks or ecosystems that provide specific products and services (or service products) to specific types of people at specific times of market need. In other words, these functions tend to ‘reach across’ vertical markets, specifically to service those needs. The entire notion of a needs-based economy – one in which natural and human resources are NOT in unlimited simply for supranational corporations – is what we are dealing with here. This is also why we can no longer separate disciplines like ‘cause marketing’ or ‘social marketing’ or ‘impact investing’ or ‘social business’ or ‘resilient business’ from our efforts in the marketing, product development and innovation domains. As a former agency executive, I’ve experienced the hypocrisies of marketing and advertising firsthand. Part of our ‘bad behavior’ is a blindness to innovation (via a strict adherence to convention), part of it industry hubris, and another part is an inherent laziness in wanting to ask better questions. One also might argue that some marketing disciplines have become so sophisticated that the obsession lies with the craft, rather than the substance of what actually happens ‘on the ground’. Are all agencies bastards in this regard? Of course not. The larger point is that salvation for intermediaries lies in federating knowledge and learning through experimentation, and, well, most agencies aren’t very good at that. Not yet, at least. Regardless of any of these agency positions, there are a host of studies that address the ways in which people are affected by ads and onslaughts of marketing messages, as well as how they feel about them. Most of the data and insights are inglorious; probably the most telling are the studies based on ‘native advertising’. This one from MediaBrix and Harris Interactive is a pretty good indicator of why consumers have become activists in editing and avoiding ads altogether. Granted, many of these studies don’t ask questions more oriented towards cultural behaviors or daily rituals – things that people do which are reflective of their beliefs, cultural traditions or family values. Choosing between the better or lesser of evils (“Would you rather go with option A, B or C in this rotation?”) isn’t exactly leading marketers in the direction of enlightenment. The Bhutan approach to relationship metrics (specifically GNH or Gross National Happiness) is really where these survey questions should lead… But let’s not get ahead of ourselves. What this says is that marketers and advertisers are still talking to themselves in giant echo chambers, and are making huge, sweeping assumptions about customer and supplier behavior when they don’t have to. In short, companies, via their brands, have an opportunity to ask far better questions, and this is precisely where companies will continue to make or lose money. One of the smartest things I’ve heard about the discipline of marketing in recent years came from General Electric CMO, Beth Comstock, who unapologetically proclaimed that “Marketing is now about creating and developing new markets; not just identifying opportunities but also making them happen”. If you were to look more closely at the word marketing, it would seem that this approach in building markets is a given, but of course it isn’t. Most people still think of marketing as a form of outreach, whether that comes in the form of ads, direct mailings, social media conversations or live events. There’s nothing wrong with that of course, but it tends to leave out the real opportunities on the ground; where there is human need, there is an opportunity to co-create products and services that can ‘scale’ alongside of the paces of the market. What we’re really talking about is marketing, branding and advertising as forms of intelligence. Yes, intelligence. Like the kinds government agencies use to get a leg up on geopolitical positions. Brands really are no different. Think about it: the same proxies we use to measure performance, reach, frequency and impact, are the same lenses through which we can understand the behaviors of the market, often in real-time. To boot, one of the major ways intelligence agencies gather and store your personal information is through advertising cookies. A big part of my role at the agency was to gather intelligence without ripping off people’s data; we didn’t make ads, nor did we spend a lot of time producing content – we were gathering intelligence for our brand clients, and helping them make better business and marketing decisions. Now, of course, GE is not innocent of its own violations in the market. But again, it is becoming a more transparent organization as a result. Other companies, like P&G, are also taking significant steps to not only understand their customers better, but to support the local ecosystems from which they make their handsome profits. Unilever, for example, recently went off a quarterly earnings schedule and has committed itself to being a ‘100% sustainable company’; it sees its present and future earnings potential as reflective of ecological variables, and the efforts to tie company performance to those variables. If we come back to the idea of marketing itself, media assets are opportunities to connect meaningfully with people. But in order to be meaningful, we must also be altruistic with our intentions. In other words, it isn’t enough to tell stories differently or manage conversations directly or have impeccable customer service if what companies are doing to people is morally objectionable. Part of the problem of ‘discipline blindness’ is also tied to the economics of media. Specifically, we are basing media and messaging efficacy on outmoded standards (such as impressions-based models), and overcompensating with an emphasis on things like automation. Case in point: The big talk at the CM Summit last year (May 18th, 2013 onward) and the all-day panel I co-ran shortly thereafter with Sasha Grujicic at the Banff World Media Festival had been around building a new kind of ad ecosystem. This ecosystem specifically refers to things like a native advertising or programmatic advertising format, which basically focuses on real-time bidding in exchanges that often peddle inventory or content for cents on the dollar, or ways to optimize remnant or premium inventory through various affiliate/publisher models. For one, they presuppose that innovations in developing the company-customer relationship are predicated mostly on technological advances (read: fancier features and easier ways to transact within exchanges). For another, they almost completely ignore the power of people, their communities, and the ways they are willing to participate when the terms for consumption are more equitable. I want to be clear: I’m not talking about building a community through social media that is based on largely uninformed brand guidelines – I’m talking about actually cooperating with various stakeholders on the ground, and learning what their true needs are. These are people who produce, consume, distribute and have a stake in how all of this affects their local ecosystems. What this really points to is a profound shift in priorities, one that takes us from models based on opacity, forced messaging and a reliance on commodified inventory, to models that place openness, adaptivity and conscientiousness at the heart of marketing and communications. That will of course create higher quality standards for the media being created, to include the inventory that is being bought, sold and bartered. Tackling the Coca-Cola problem head on (thinking & acting through ecosystems). So, back to Coke and its brand. Coke’s escalating issues with obesity and other infrastructural issues will not go away with a series of clicks, blog commentaries, tweets, ‘converged media’ or fancy ads. This represents a classic example of how traditional marketing and communications (to include ‘social media’) can’t solve real world problems — problems that are not only complex, but those which require a whole new way of doing business. The idea isn’t so much that brands and their products or services need to be perfect, but the overarching idea that they do need to be more humane. This means that operations must be far more empathic in how they treat people (customers and employees), and means that companies must do their best to empower ecologies, not just aspects of local systems that increase their margins in the near-term. Suffice to say that things like P/E ratios, EBIDTA, market capitalization and increasing profit margins are not exactly leading indicators or signifiers for a sustainable brand, or a profitable brand, for that matter. Further, it will be impossible for companies to maintain the types of margins they have now without more earnest investments in the socioeconomic environments on which they lean, directly or indirectly. In all fairness to Coke, the company is actively pursuing areas of impact investing, community building and infrastructural development to include Internet access for poor regions, water purification, vaccination storage and solar power innovations. And it has announced through numerous channels that it fully intends to improve upon various social business models as part of its overall business strategy. It also is actively investing in new technologies through venture efforts in order to build a new kind of value chain. Coke does recognize on various levels that building a resilient business requires addressing deep economic issues with far more vigilance. Yet, no one is ‘off the hook’ just by declaring this intention and by hoping that large-scale change will occur through mostly isolated efforts. Yes, that is an all-too-familiar story. However, from a media, data and technology perspective, there are some things the brand can do in the shorter-term that will help move these efforts along more smoothly. A lot of the work I do involves creating scenarios, or imaging possibilities, so that more positive and productive futures can be realized. 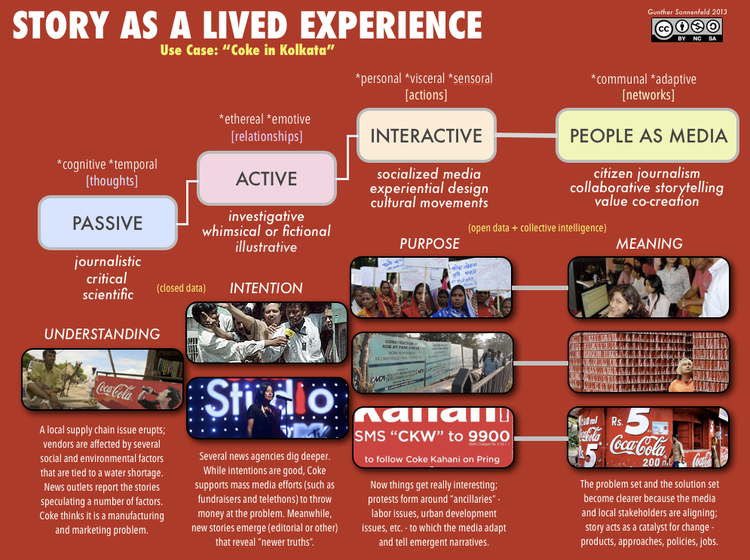 So, I thought I would take a Coke use case and provide a snapshot of what ‘newer’ disciplines like data journalism and participatory storytelling can do to revitalize the socioeconomic relationship between brands and ‘consumers’, or whom I’d just prefer to label as people. This is a snapshot of “Coke in Kolkata”. Kolkata is an amazingly diverse Indian city which is experiencing, and has been experiencing, the kinds of cultural and wealth stratification that touch upon many of the systemic issues mentioned atop this post. It is also ground zero for some of the major water issues Coke and other companies are experiencing within their supply chains (water tables, in particular). Here, we see a water issue erupting within the local supply chain. Timely and relevant, I would think. 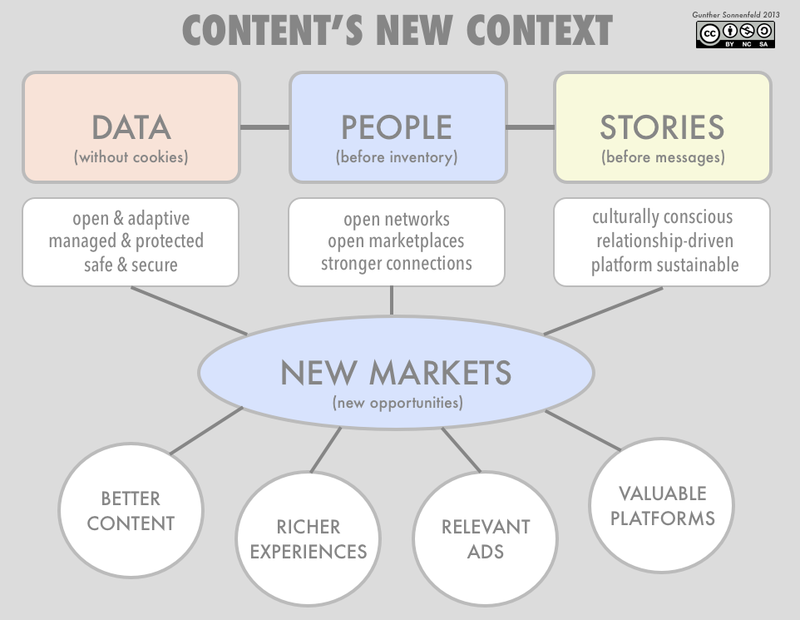 The graphic should be fairly self-explanatory; it basically takes you on a journey from the moment this perceived issue erupts, and shows how a different way of extracting and cultivating a story lends to the consensual development of ideas that not only become authentic brand artifacts, but those which provide a basis for product development and job growth. Under normal circumstances, the usual suspects — media agencies, PR companies, social media vendors, product innovators, sustainability firms, et al — would work mostly in isolation. More critically, the idea of storytelling reverse engineers a very staid and cumbersome set of processes that doesn’t actually move the needle of the business or nurture stakeholder relations. In this case, notice how real world solutions can be crafted from mostly closed data loops to those that reflect a group or collective intelligence. What’s interesting to note here is that Coke announced this year that it would be spending roughly $400mm towards ‘new media’ efforts; yet, this whole exploration, at its core, is an issue of infrastructure, not marketing, nor production, nor is it necessarily an edict linked to ‘innovation’. This is the fundamental problem we all face as business and market stakeholders: how to be a lot smarter with our data, our technology and our media so that we can solve problems that are deeply cultural. It is not difficult to see what is possible. We have the tools and the means. Yet, many global brands march on to the same beat with different drummers. The time has come to shift the mindset away from a heavy reliance on automation, quantitative reasoning and largely ineffective performance standards, and towards interactions on the ground. We need to challenge our uses of data, look at storytelling in multiple modalities, and explore at the edges with our social technologies. These inroads will allow people to become true advocates of a brand, and influencers of ideas that actually matter, whether they exist as messages, stories and/or pure informational utilities. The choice is ours. Let’s do more of the right thing, and build up those muscles for real change. Gunther is a global advisor in social technology, business and media innovation. Through labs, workshops and other types of creative engagement, he applies strategic insights to new market opportunities at the early stage, M&A and co-op levels. He has co-developed over a dozen proprietary platforms in the search, social media, business intelligence, digital content and analytics domains, and has won several awards for his innovation work, including a Forrester Groundswell Award in 2010. As a Venture Partner at K5, Gunther is responsible for building the fund’s social entrepreneurship platforms, in addition to actively mentoring students at Claremont McKenna’s Innovation & Entrepreneurship Program. He is also an advisor to the C-PET Futures Platform, a DC-based policy reform initiative for emerging technologies. 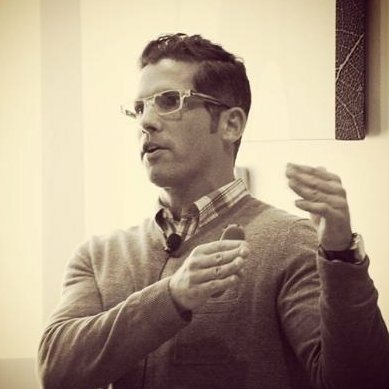 In addition to startups, he has worked across industries, with a wide range of brands including Toyota, Charles Schwab, Adobe, HP, Kraft, Unilever, Google, Hulu, Microsoft and Skype. Gunther speaks frequently around the world on the topics of ‘big data’, digital convergence, multi-platform storytelling and emerging markets, and has keynoted alongside of visionaries such as Sir Richard Branson, Guy Kawasaki, Arianna Huffington and Jonathan Harris. He is currently writing a new book called “Dreamweaving”, which he will self-publish later this year on his own platform (Paperlet).